SAGE India Digest: Demonetisation: A means to an End? Demonetisation: A means to an End? At the midnight hour of 9 November 2016, two shock therapies were being administered on two sides of the globe, the United States of America (USA) and India. In the USA, against all the forecasts of election pundits and renowned economists, Donald Trump was winning in one constituency after another. In India, Prime Minister Modi had announced that after the midnight of 8 November, Indian notes of `500 and `1,000 would cease to be legal tender except for some specified uses, and the holders had until December 30 to deposit their notes in the banks for conversion into new notes. Pandemonium broke out in India, and people were flocking to all kinds of shops to use their notes to purchase whatever they could before midnight. An avalanche of criticism flooded the television and local newspapers. The exercise was basically propelled, as the Prime Minister said in his announcement, by the desire to check corruption and build the foundations for clean prosperity. Demonetisation in India, thus, was not a financial exercise. It was about curing corruption and achieving clean growth. The electorate has strengthened the hands of the government to strive for not only cleaner India but also richer India. This entirely unfamiliar situation of 'Demonetisation' unleashed a huge debate on television, in newspapers, and on social media, the likes of which had never been seen. Several months later, we are still questioning: Was this a disastrous blunder or a leap forward? 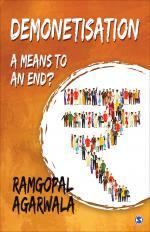 To answer these questions, a renowned economist 'Dr Ramgopal Agarwala' takes an incisive look at the events that led to demonetisation, the aftermath, and its implications. He sifts through many irrelevant rants, a lot of politically motivated mud-slinging, and asks the most important question: What now, what next? Grab your copy today to find out answers to your questions on Demonetisation. Demonetisation has big effect on Indian economics. Corporates who want any kind of Legal and Financial Consulting, IBS is here to help you out.